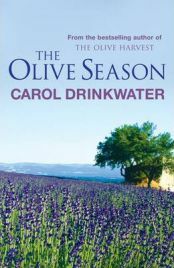 The Olive Season is the second in Carol Drinkwater’s series of autobiographical books about life in the South of France, and the trials and tribulations that come with running an olive farm and doing up and old villa. I first read the series years ago when I bought the first three books during one of my crazes for travel writing (escapism in an Aberdonian winter). I enjoyed them but wasn’t as in love with them as I was with others. On revisiting them recently however, I felt I appreciated them more.